Improve both your view and the appearance of your facility with professional window cleaning services. Interior and exterior window washing should be performed a minimum of twice per year and more frequently in environments that are exposed to salt, traffic pollution or weather residue. Our professional window washing services are competitively priced based on square footage and ease of access. 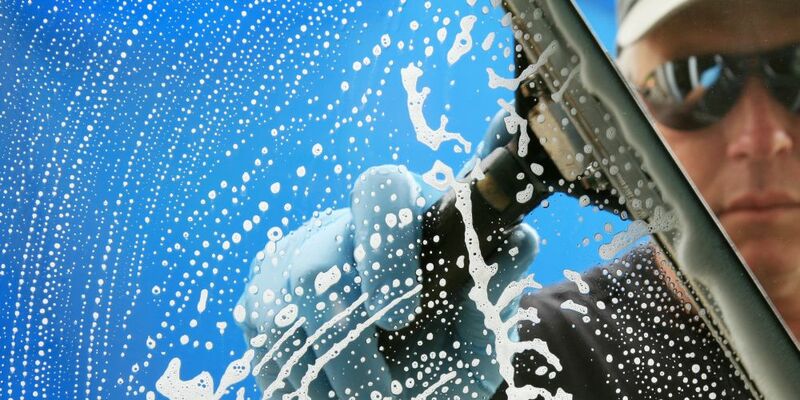 Customers often request regular interior glass and window cleaning as part of their overall Blue Wave service plan to ensure that smudges, streaks and dust get removed on a consistent basis. Many customers request to have the interior of their windows cleaned at the same time the exterior is being cleaned that way both sides are perfectly clean. Regardless of whether you are a current customer who receives regular service or just need your inside windows cleaned on a periodic basis for events that you want to ensure your windows are sparkling clean for, we can ensure it gets done properly and quickly. Create an amazing first impression with your visitors, customers and employees by having sparkling clean exterior windows. The Blue Wave cleaning system uses state of the art commercial window cleaning equipment to ensure quick, efficient and high quality exterior window washing results. We use biodegradable cleaning agents that are eco-friendly and will not harm the building façade, shrubbery or lawn. As with interior windows cleaning, pricing is based on square footage and can increase for exterior windows above the first floors.